And, to finish the month out, another paint-out and an opportunity to do plen-aire painting in an even more beautiful place. This time, we were in the Genesee Valley, in Plumas County. Genesee is this magical place, tucked away in the Sierras, a long way from the noise of traffic and busy city life. 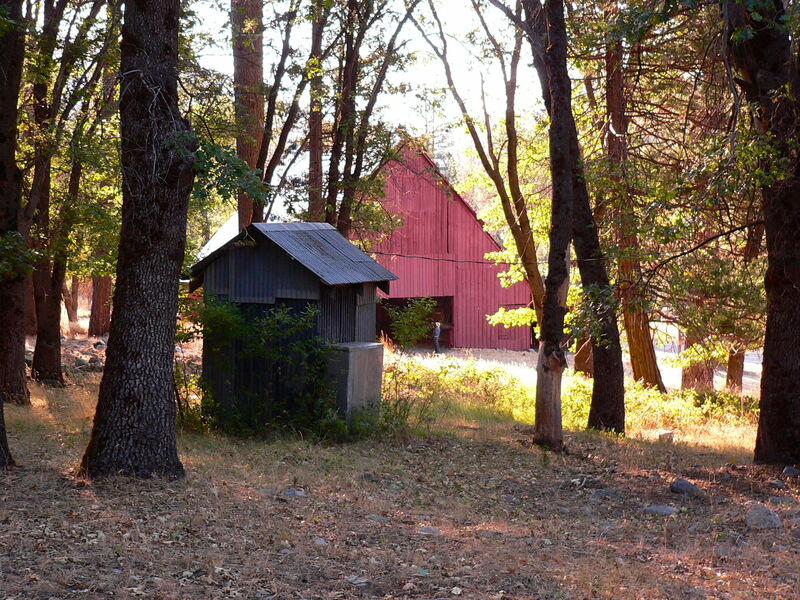 Here, the Feather River Land Trust has purchased a tract of land, called the Heart K Ranch, to preserve and protect in perpetuity. In order to procure the land, the Trust had to borrow quite a bit of money, so they are trying to raise the funds to pay off the loan. As far as I know, this was their first paint-out. 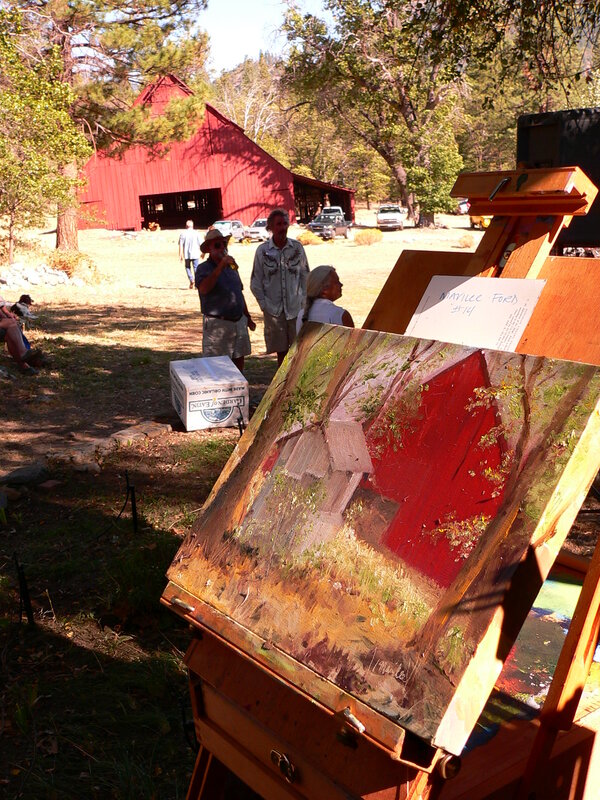 Several artists arrived at 8 am to start painting, and by 2 pm, there was a crowd gathered to view and buy the art, as well as several other auction items. Volunteers, I assume residents of the valley, put together a fabulous lunch, even serving barbequed oysters! There was music, Maidu drummers and a “nature walk” where local experts shared about how the land was used when the Maidu Tribe occupied the Genesee Valley. 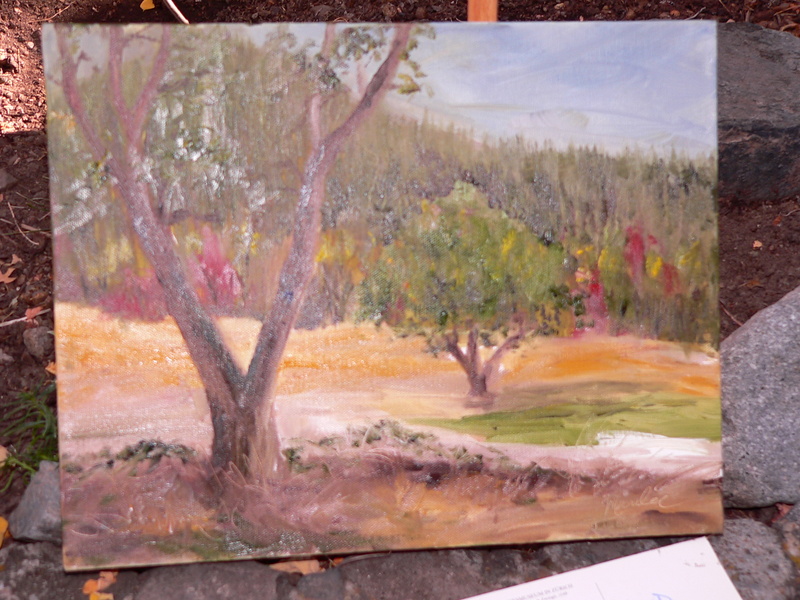 The artists donated their time and their proceeds to the Feather River Land Trust. It was really fun to have people come along, appreciate what you were doing, and then to buy it, especially to benefit such a great cause. The red barn is the first fully restored building on the Heart K Ranch. I painted with oils here at the Heart K. I discovered the challenges of doing that plen-aire…the oils weren’t dry when people were ready to take the paintings away…and wet paint gets all over people who handle the paintings! Now, I know you’re not supposed to handle wet oil paintings, but in this circumstance, it was unavoidable. I finished the first painting above, and because I had more paint, I turned and looked out over the valley and painted the second one below. Genesee Valley, oil painting, sold at silent auction at the Heart K Ranch. We left the gathering and drove back on a dirt road, which took us around the other side of Genesee Valley…what a treasure of a place it is. Another surprise of the day was re-connecting for a brief moment wtih Vicki, who I used to work with at Seneca District Hospital. We were both OB nurses. She was my Vanna for the auction! It realy was a very special day. Rob and I are in love with yet another place on this beautiful earth! Next Riverfront Art Gallery celebrates 1 year! !